Want to learn how to make jewelry? Check out this eBook full of easy jewelry making for beginners! Jewelry Making for Beginners: 11 Beginner Jewelry Projects! Learn how to make bracelets, necklaces, and earrings using basic jewelry making techniques! If you're the type who can't tell the difference between a lobster clasp and a crimp bead, then Jewelry Making for Beginners: 11 Beginner Jewelry Projects is just what you need. As you learn how to make bracelets, necklaces, and earrings, you'll be mastering fundamental jewelry making techniques in the process. Rather than just learning the skills with dry and boring "how-tos," you'll actually get to try the techniques first hand as you make your own fabulous accessories. The jewelry tutorials in this collection cover basic wire wrapping, simple stringing, a classic chainmaille weave, and much more. You'll get to learn basic jewelry making skills, such as how to open and close a jump ring, how to form a wire loop, how to close a crimp bead, and how to add a clasp, and you'll get to practice using basic jewelry making tools, such as wire cutters, pliers, findings, stretch cord, and wire. Plus, all the while you'll be learning how to make wire earrings, how to make stretch bracelets, how to make chainmaille earrings, how to make a wire-wrapped pendant, and so much more! By the time you've completed all the beginner tutorials in this handy jewelry making guide, not only will you have mastered a new crafting skillset, but you'll have added 11 gorgeous new pieces of jewelry to your own collection! Download your free copy of Jewelry Making for Beginners: 11 Beginner Jewelry Projects today! Have you always dreamed of designing your own jewelry but weren’t sure where to begin? Do you look longingly at the jewelry tutorials on the Web and think, “I wish I could do that”? Then you’ve come to the right place! This collection of beginner jewelry projects is perfect for those who are just starting out with the art of jewelry making and are dying to DIY! For those who can’t tell the difference between a clasp and a crimp bead, this free eBook of 11 easy and informative beginner jewelry tutorials was made with you in mind. Here you’ll find 11 simple yet chic jewelry projects with full step-by-step instructions for designs of all kinds. While you’re learning how to make earrings, bracelets, and necklaces, you’ll also be mastering fundamental jewelry making techniques in the process. Rather than just learning the skills, you’ll actually get to try them first hand as you create stunning accessories. Learn basic wire wrapping techniques, simple stringing, a classic chainmaille weave, and much more. By the time you finish this eBook, you’ll have mastered a new crafting skillset and added 11 gorgeous pieces of jewelry to your own collection! This eBook is a collection of beginner jewelry projects from our favorite bloggers and jewelry designers all together in one place for your crafting convenience. 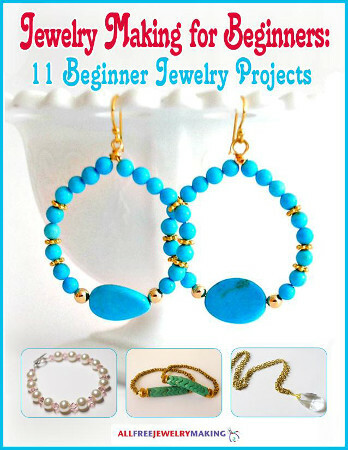 Download your copy of Jewelry Making for Beginners: 11 Beginner Jewelry Making Projects today! Learning how to make bracelets is a great way to get started on your jewelry making journey. Some of the most popular jewelry tutorials out there are bracelet patterns, so what better place to begin? With this free collection, you'll learn two basic but fundamental jewelry making techniques for making bracelets. This Glass Pearls and Crystals Bracelet is one of them. As you make this beautiful bracelet, you'll be covering some of the most essential jewelry making techniques by trying them out first hand. 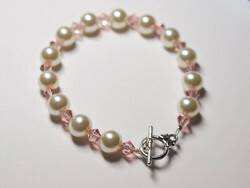 Learn basic stringing skills, how to use a crimp bead, and how to attach a clasp. Plus, you'll be exposed to some of the fundamental jewelry making supplies and tools that will come up again and again as you delve deeper into the world of jewelry making, such as jump rings, beading wire, crimp beads, wire cutters, and more. You'll also learn how to make simple stretch string bracelets when you download this free collection. Next stop on your jewelry making journey is learning how to make necklaces. A pretty necklace always makes a great finishing touch to an outfit, so this is a skill you'll definitely want to master. You'll find a few different necklace patterns in this collection covering a range of jewelry making techniques, so you can take your pick or make them all! 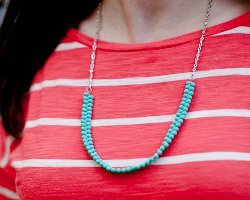 This Easy Turquoise Bead Necklace lets you try your hands at simple stringing techniques while also getting some practice working with pliers, jump rings, and chain. This tutorial shows that beginner jewelry projects don't have to be basic and boring; this necklace may be easy to make, but it definitely makes a statement! You'll be proud to show off your finished piece and your newly acquired jewelry making expertise every time you don this design. Download the eBook and get started now! Once you've learned how to make bracelets and necklaces, the next step of course is to learn how to make earrings! Luckily, this collection includes beginner tutorials for a variety of earring designs and techniques, so you can definitely find a project to fit your needs. Whether you prefer dangles or hoops, something simple or something intricate, you'll find the earrings for you. For example, who wouldn't want a pair of these Beaded Hoop Earrings? They look so trendy and professional, you'd never guess they were handmade. You may think making earrings like this is too tricky for a beginner, but you'll be surprised at how easy these are to make. Beginners will have no problem following along with these easy and informative instructions. You'll even pick up some basic wireworking skills as you make these beaded beauties. 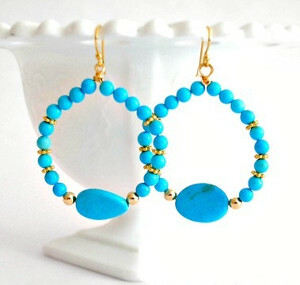 So don't be intimidated; try these earrings today! You'll also find beginner tutorials for chainmaille earrings, basic drop earrings, and basic wire dangles when you download this free collection. If you are serious about learning how to make jewelry, then you'll find that wire wrapping and other wirework techniques are going to be essential to creating the designs you desire. Wire jewelry techniques are some of the most useful and most important to learn when you begin making jewelry, which is why we made sure to include plenty of wire jewelry tutorials in this beginner's guide. From making basic wire loops to simple wire wrapping to stringing on beading wire, there are so many functions that wire fills in the jewelry making world. 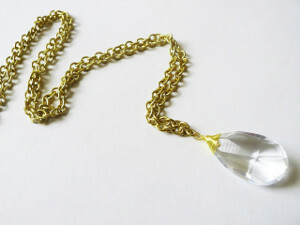 If wire wrapping skills are what you're after, then this Vintage Chandelier Crystal Necklace will be a great beginner tutorial to start with. It's the perfect project if you're learning how to wire wrap for the first time. Once you learn this simple technique, you'll be tempted to turn everything into a pendant! The wire wrapping skills you learn here will be carried over into so many other jewelry projects, so it's definitely worth your while to try this design. Find this and several other beginner jewelry projects using wire when you grab your copy of this jewelry making guide. Weekly e-mails with free jewelry patterns, beading projects, tips, collection pages, videos, and more. Chances to win jewelry-making books and products from our giveaways and contests. Access to our free pattern library full of hundreds of free jewelry tutorials. The opportunity to share ideas and help others in the jewelry-making community. We hope that Jewelry Making for Beginners: 11 Beginner Jewelry Making Projects helps you to achieve your dreams of becoming a DIY jewelry designer! Don't let inexperience hold you back; it's never too late to pick up a new hobby! With this collection of beginner jewelry projects, you can become a jewelry making master in no time. Acquire essential skills and jewelry making techniques as you learn how to make bracelets, necklaces, and earrings with these easy and accessible beginner jewelry projects. By the time you finish with this collection of jewelry tutorials, you'll have a new hobby and 11 new pieces of jewelry to show off! Do you have woodworking projects? I'm so excited!!! I'm just beginning to learn about jewelry making and I feel like I stumbled into a gold mine! These may be beginning pieces but they DO NOT look childish in any way. I want to make jewelry so I can wear and give gifts of beautiful distinction! The most difficult part for me is knowing which piece to make first!!! These are so great for beginners. I am going to give this idea to my friends in hopes that they will try making some for themselves. Every time I wear something I made I get pleas to make them all one. I tell them it's easy but they don't believe me so this just might convince them. Then I could get to make some for myself to wear. This is just what I needed to get started with jewelry basics. I've tried other patterns with seed beads, but I need more practice first. I'm going to start with something simpler like the pearl and bead bracelet. When you use wire for making kids bracelets that's not stretchy and you can double thread, to make the bracelet hold better. What is it called and where do you buy it from? Thank you so much for this download of great jewelry patterns. It is wonderful that I can actually see what I need to do to finish these projects. Your pictures and instructions are so good!! I mispelled my First name by mistake, now it won't let me join!br Rita missed spell ? Ryit? name is Rita.